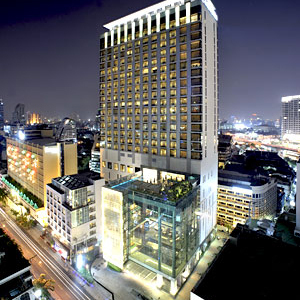 Located in Silom area, Le Meridien Bangkok is steps away from Patpong Night Market with easy access to the sky train station. The hotel’s Bar (Bamboo Chic) offers signature cocktails in a relaxed atmosphere while Latest Recipe provides all day dining and a famous Sunday Brunch. The hotel also hosts many galleries and exhibitions to support local and international artists. At the Henry Dunant Road intersection turn right onto Surawong Road. Drive approximately 100 meters and find the hotel being located on the right hand side.